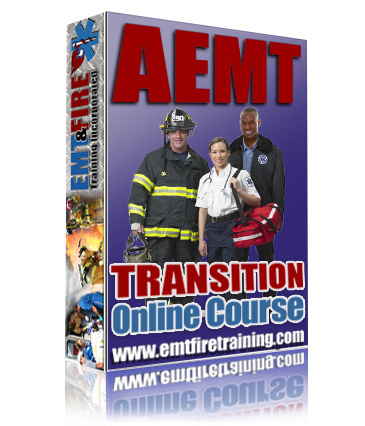 This Online Advanced EMT (AEMT) Transition Course is State Approved and NREMT Accepted. This Online AEMT transition course is a self-directed, interactive, distance learning course that is approved for NREMT AEMT Certification. The course curriculum covers all AEMT knowledge and skill requirements. It is designed to not only bridge the gap in knowledge between EMT Intermediate-85 and AEMT, but to also prepare you to be successful on the National Registry Advanced EMT (NRAEMT) cognitive exam. If you are an EMT I-85 who is ready to transition to the new AEMT level then this is a great educational opportunity. This is a comprehensive program that allows great flexibility. You direct how much effort goes into your learning. If you already know this information but just need a certificate that says you can take the NREMT exam, then you can simply take all the chapter quizzes, section tests, and final exam, get a score of 80% or higher in the course and pass the end of course psychomotor exam. If you need more information you will be able to attend live virtual instructor led training (VILT) sessions, watch recorded lectures, read the book, use the companion website online activities and have access to our staff of instructors. Upon successful completion of this AEMT Transition course a student will be awarded a Certificate of Completion that will authorize them to take the National Registry of Emergency Medical Technicians (NREMT) AEMT cognitive examination. After passing the examination the student will be awarded NREMT AEMT Certification. These certification exams are used as basis for state licensure or certification in most states, or are honored with reciprocity during the licensure process. NOTE: You will have to pass an end of course psychomotor exam over 5 skills required by the NREMT. Our Program Medical Director has authorized us to offer a live web-cam testing option for students unable to attend one of our in-person exam sessions. 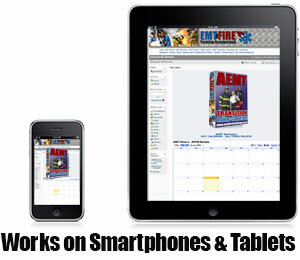 • 24 hour online access to EMT & Fire Training Self-Paced Learning Management System (LMS). All of the didactic portion of the course is completed online in the LMS. This includes both live or recorded lectures, videos, quizzes, exams and interactive activities. 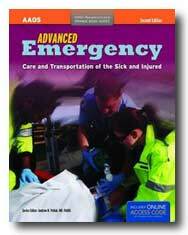 • Textbook for Advanced EMT (AEMT). When you complete your enrollment your AEMT book is shipped from the publisher Jones & Bartlett. We are currently using AAOS Advanced Emergency Care and Transportation of the Sick and Injured 2nd Edition for the AEMT course. This new book is designed to follow the new Advanced EMT level as established by the National EMS Educational Guidelines. • 24 hour Instructor Helpdesk. Students can use email, live chat or the LMS chat system to communicate with instructors 24 hours a day. Typically a live instructor is only available during scheduled virtual classroom hours. In cases where a student needs to speak to an instructor by phone, we will be happy to arrange a time to call you. NOTE: You are not required to attend live sessions, but are more than welcome to do so. The final educational component of this Advanced EMT (AEMT) Transition course is the end of course psychomotor exam over the following skills. Once you have completed all the required quizzes, tests, and assignments you will need to schedule an exit test session with our staff. NOTE: If you do not have access to the required training aids for this course we will be offering a rental program that will allow you to obtain the needed equipment to succcessfully learn and pass the psychomotor components of the program. Contact us for more details. EMT National Training is the top of the food chain for NREMT cognitive exam preparation and you get it FREE as long as you need it. Used by over 60,000 EMT's and Paramedics to study for the NREMT exam, there is nothing on the market that even compares. • NREMT cognitive exam testing fee. Upon successful completion of the AEMT Transition Course, EFT will provide each student with a voucher that can be used to pay the $100 cognitive exam fee on the NREMT website. Payment plan available with $400 Down & $50 processing fee. Must be paid in full prior to end of course assessment. Contact us for more info. • Good computer skills. This class is not for those just learning how to navigate the internet. • Access to a good quality web-cam if you intend to test by web-cam. • High speed internet connection for viewing video lectures and activities. * EMT & Fire Training Inc. is a Proprietary School registered with the Idaho Department of Education. In addition, the school is recognized as a training institution by the Idaho Department of Emergency Medical Services.